Time! Who needs more time? Yes, me, too. I have a great tool for you! Although the website does not provide more time (sigh), it may save time by allowing us to dive deeper into promoting our library with a variety of social media tools – all at one time. Social media can be a great way to tell your library’s story and advocate for the things you do that impact your school community. 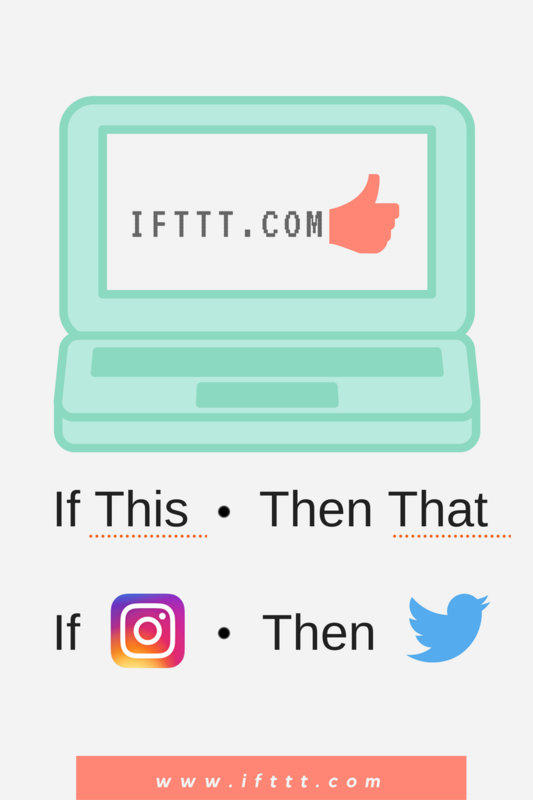 If This Then That (IFTTT) website connects different social media tools by using “recipes.” For example, you may post to your library Instagram account and the same post will automatically appear on your library Twitter account too. If I favor a tweet on Twitter, it will post that tweet in Evernote. I can then go back into Evernote and add tags, so I can easily find my favorites. If I add a YouTube video to my YouTube channel, the information will go into a Google Spreadsheet. This allows me to keep track of the videos I create and view the links easily. If I add an item to a specific Pinterest board, it will place that link into my Diggo account. If I place an item in Diggo, it will automatically go into my Evernote account. Post a Video on YouTube and automatically tweet the video on Twitter. Create a blog post and tweet a link to the post. Post a photo on Instagram and it will post to Facebook. Like a tweet on Twitter and save the item in Evernote. Once you create an account, there are two main ways to set up recipes. A recipe starts with the first tool that you manually place an item and the second tool receives the item from the first tool. Thankfully, IFTTT has many pre-made recipes to get started. Search by social media tool name to view pre-made recipes from the top toolbar. Use the Browse feature to view a variety of recipes. Use any of these pre-made recipes by putting in your account information to connect. Find ways to combine your favorite tools to streamline your work advocating for all the many things you do each day or week. If you are not convinced about how great this tool can be, AASL included the site on the Best Website List in 2015. View other tools from the 2016 list here. View my IFTTT profile for a few of my recipes. List any other IFTTT recipes in the comments section that you utilize.